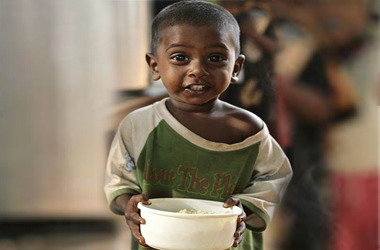 A small donation of US $1 or Rs.50 per day can help feed a hungry child for a year. 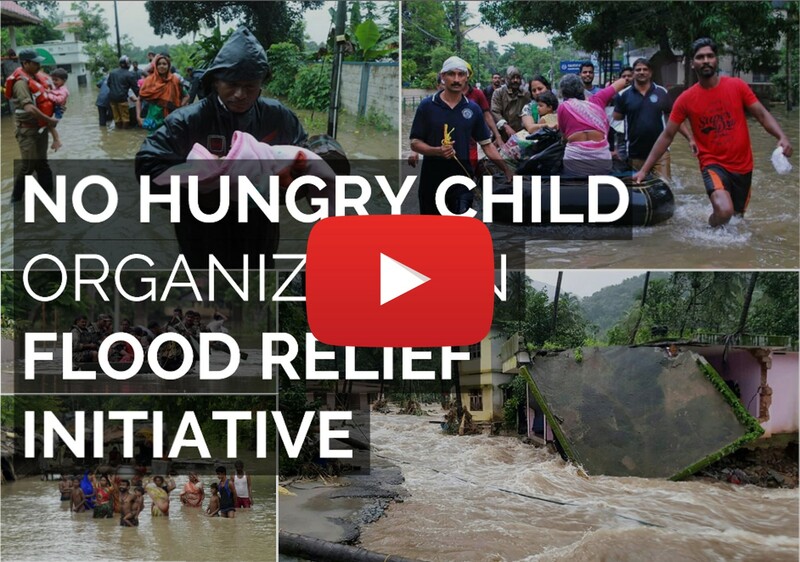 Contribute to one of India’s leading Charities to help our pioneering & pain-staking endeavour to ensure that no poor or under-privilaged child goes hungry in India. They are our future and yours. 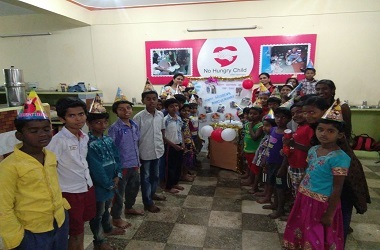 No hungry child concept was originally conceptualised by Mr.V Sridhar, who gave up his Corporate Career in the year 2000 to serve the Social Development Sector. Initially, he started with an idea of helping the Social Organisations in the area of fundraising to ensure that Social Programs do not take a back seat due to paucity of funds. 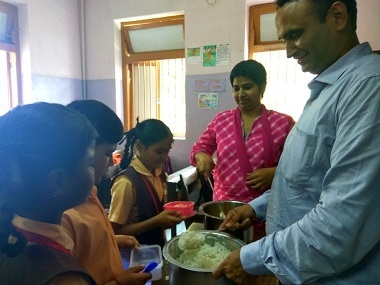 With the help of kind hearted philanthropies, he started the Nutritious Meal Program in Bangalore and realised that this concept should spread across the state then nation then the rest of the world. In doing so, Mr Sridhar also realised that he has to network with as many NGOs as possible to ensure that this Nutritious Meal Program is implemented all across the country. 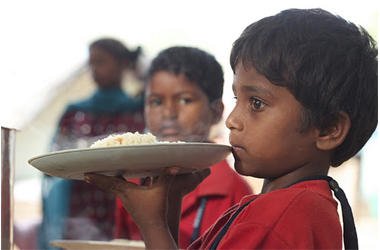 Pioneering No Hungry Child Free Food Program is focused towards distributing hot, nutritious and fresh food to poor, needy & hungry children across pockets of poverty in India. 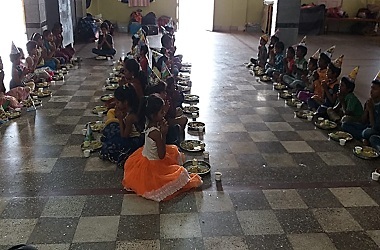 We have a daily nutritious meal coverage of more than 20,000 hungry & underprivileged children and our daily food distribution regimen is smooth, efficient and dependable - 365 days a year. Safe and clean disposal of Paper Plates and Cups. Mandatory cleaning and scrubbing of all vegetables used for cooking. Mandatory washing of hands before cooking. Mandatory cutting of nails by all food handlers. Purified water to be used for all cooking purposes by boiling, filtration or chlorination. Mandatory Hair covers or caps. 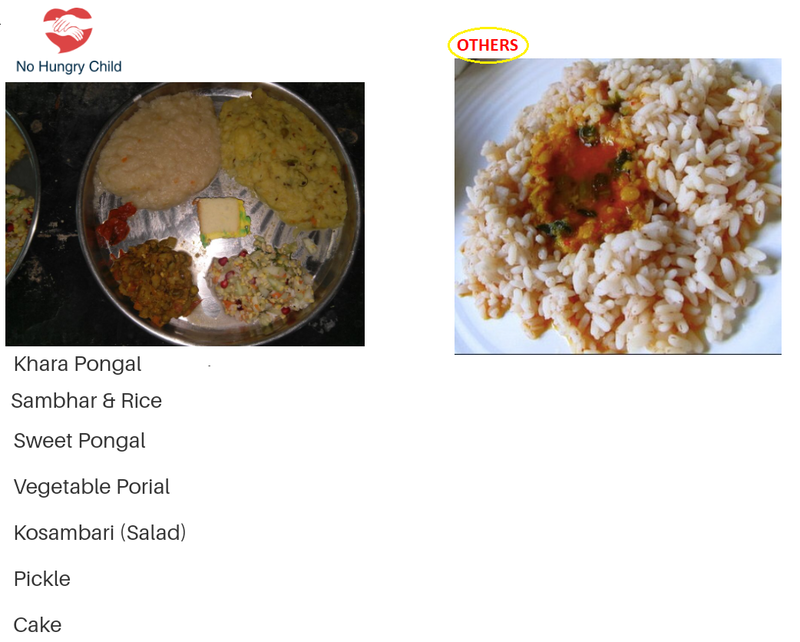 The menu for North India would comprise of Whole Wheat Pancakes (Chapathi / Roti / Phulka) with fresh vegetables (Sabji) and Vegetable Rice / Pulav , followed by simple desserts made up of cream of wheat (Halwa) etc. The meal ingredients are chosen to be nutritious, healthy, easy to prepare, store and transport so that maximum freshness and nutrition can be retained through the Supply Chain. No Hungry Child program is focused towards distributing Nutritious food to poor needy children along with Education support. 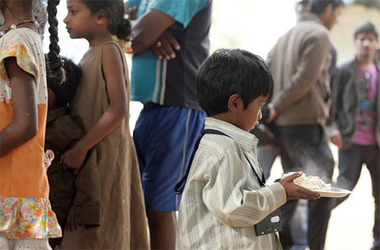 We have a daily nutritious meal coverage of more than 21,000 under-privileged, Orphans & Physical challenged children. Our daily food distribution regimen is smooth efficient & dependable-365 days a year. 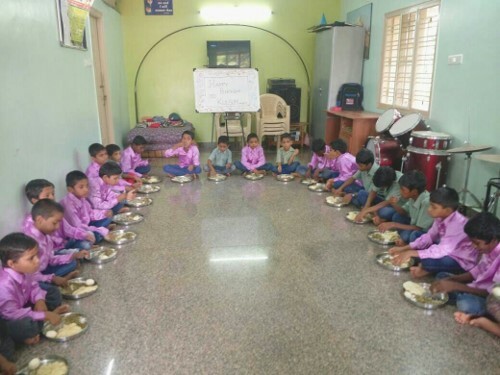 No Hungry Child Organization is a registered nonprofit, non-religious Non- Governmental organization working for underprivileged background children providing them the Nutritious meal & Education support , headquarters located at Bangalore with our work force spread across the whole of India. We have been recognized by the Government of India for our outstanding services to the society. 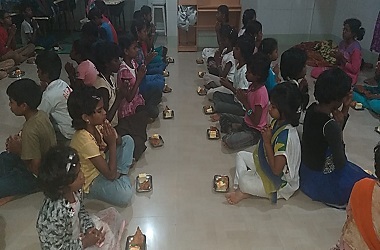 In order to build the donor’s confidence, we arrange live video conference with the children and make Donor's interact with them on special occasions like their birthdays, anniversary celebrations, rituals, etc. A few live video have being updated in our website above. Please watch for 2-3 minutes and we hope you will like it. With the individual donors support we have been able to reach out to some section of the society. Still there are millions of children who are in need of and we would be grateful if you could get involved in supporting us. The core objectives are to strengthen the under privileged and economically backward rural population by actively implementing various Rural Development programs and creating awareness by setting up Knowledge centers and mobilizing community involvement though pro-active volunteers. This consistent and persistent implementation will bring about unprecedented improvement in the lives of rural citizens of India. 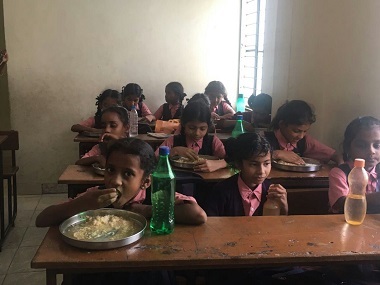 One of No Hungry Child key campaign is aimed towards providing daily nutritious & hygienic Nutritious meals to poor underprivileged children across India. 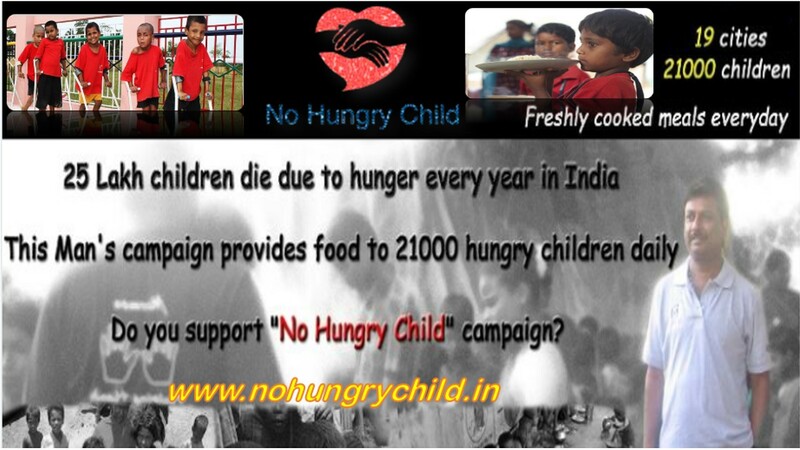 No Hungry Child Charities’ aim for this campaign is "no child should be left hungry in India”. 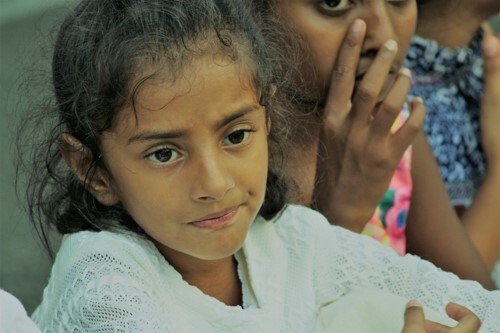 In a country where the rich-poor divide is stark and while millions splurge on good food, we find it unacceptable that even bigger millions of children have to go to bed hungry without any means for food or nutrition. 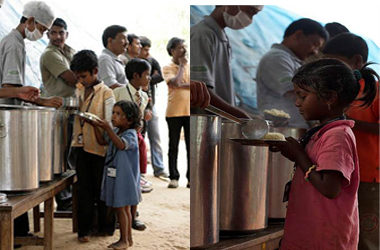 We are passionate in our dedication to the cause of feeding under-privileged children across India. Towards this, we have ensured a high quality food supply chain and an uncontaminated route by which fresh, hot meals are supplied daily in controlled gatherings. All our operations are quality certified and are open for inspection by our donors at any time. 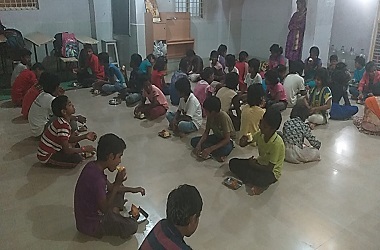 No Hungry Child today has associated with Registered NGOs who have offices at Bangalore, Chennai, Kolkata, Mumbai and Rishikesh with our work force spread across the whole of India. My Best Birthday... Another Year passed by and today I am 50, in search & belief that the little children of this beautiful world who are alone or with single parent struggling for a piece of bread can get the education and a place to stay happily. I started preaching and speaking that Always smile back at little children who are alone because if you close your eyes or ignore them is to destroy their belief that the World is Good!! 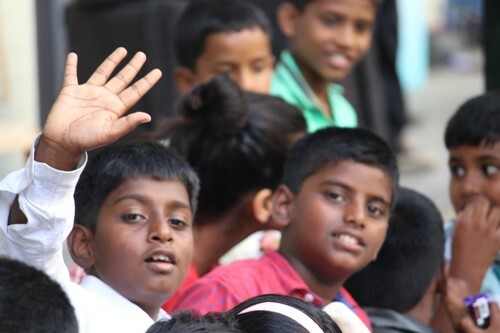 Thank You to all of You....As I enjoyed my morning with the lovely adorable kids and see them smiling!! "STOP MIGRATION, STAY-ON WITH RURAL DEVELOPMENT & FOOD SAFETY". This is the theme for the World Food Day celebrated today, established in 1979, streamed & led by UN. As on today too,800 million people stay starved each day,60% of women stay hungry. Each year globally .5 million children die of hunger and malnutrition, and unfortunately in the International Index for Food Safety, India stands in 100th position. In order to highlight areas needed for action and provide a common focus, projects must revolve around, rural simulation, child nutrition, because only seasoned agriculture – together with support for education and health – will turn this situation around. In spite of the importance of agriculture as the driving force in the economies of many developing countries, this vital sector is frequently starved of investment. In particular, foreign aid to agriculture has shown marked decline over the past 20 years. Almighty has been kind to many of us to be better fed and stay away from hunger. This blessings we must transcend to at least few of our own people, who are less privileged and ensure we contribute in this build of a Humanitarian Needs. 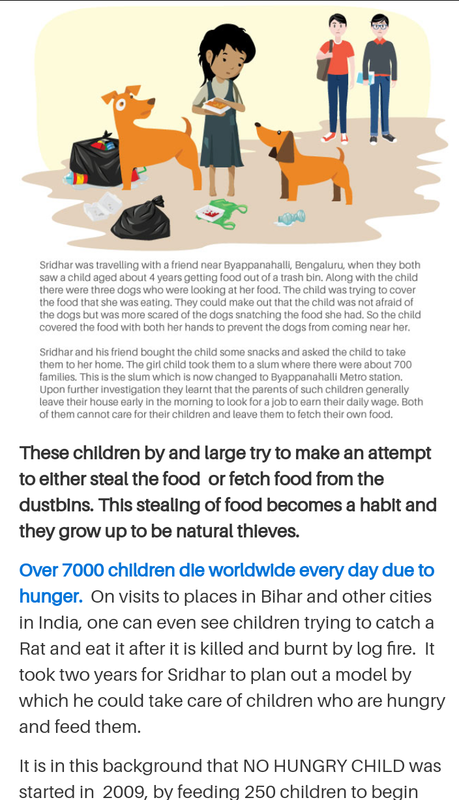 My friend and a compassionate human, Amitava Ghosh, on volition, took an initiative of being actively involved in the global mission of "NO HUNGRY CHILD" and contributes yeoman to the society, in whatever ways he can. We too, in similar, be little tilted towards such hungry sprouts of Almighty and be a good stem and a root to support them. Look to roots, come back to be an innovative agriculturist. Spend your walks with people who look to your legs !!!. Passion and Compassion will only make a Nation and not otherwise. Thanks for reading & supporting the cause. 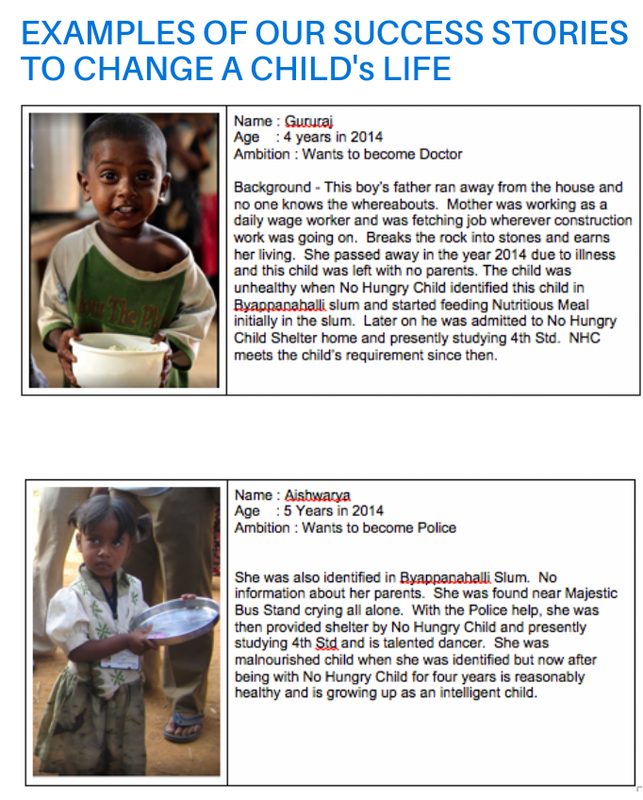 On behalf of my mother and the Venkit family, thanks a lot to Mohammed and the team at No Hungry Child. This process was very smooth and the sincerity of the work you do comes across loud and clear. Dear Mohammed, Thanks for making my Birthday special with children in video conf. call. I trust No Hungry Child is doing a great service towards humanity. I will continue to support this noble cause. Thank you so much Team.. This looks really good and made my Son Aahan's 2nd year birthday very special. May God bless all those wonderful kids. Keep up the good work. Thx. I felt like donating towards meal for feeding physically challenged children you guys gave me a very good opportunity to be a part of this organization feeding those little ones felt very happy. Thank you. No hungry child God Bless. Trustworthy organization to be a part of it and donate towards feeding hunger children in India, I wish let almighty god bless you all for all your good work & I wish your establishment spread throughout the whole world. Thanks for making my child’s birthday so wonderful and special. I felt very happy visiting the project area children made my day. God bless you all for your good work. Good cause guys!!! Thank you so much for your wishes and blessings on our wedding anniversary, my wife was so excited seeing smile on these little children. All we had awesome time spent with them. All the best, please continue this noble work. 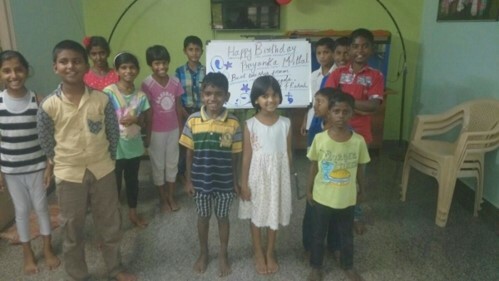 Due to my busy schedule on my wife’s birthday, couldn’t visit the children place thanks for your live video conferencing with those little children, I was so satisfied on my spending’s towards this organization. Thanks for all.